A good golf swing starts with the proper grip of the club. The Fingerloop Golf Training Aid positions the club closer to the fingers, which increases control and wrist movement. 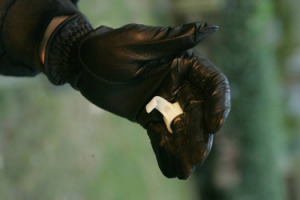 The Fingerloop Training Aid can be worn with or without a glove on any preferred finger. The Fingerloop is a golf training aid that helps golfers keep the club up by the fingers and out of their palms - improving their swing! Reduces slicing - making the game of golf more enjoyable! I was pleasantly surprised how well I struck the ball while wearing the Fingerloop Training Aid. I would recommend this product because it performs exactly the way it's advertised. This product makes a huge difference in my grip and control of the club. I have easily improved my game by 7 or 8 strokes. A great product that I would recommend to anybody. This is a good aid for the beginner... Also good to refresh the player with some experience that may have gotten into a rut. 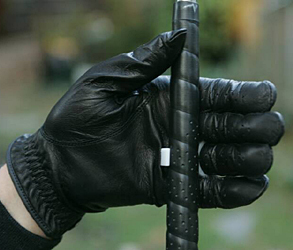 An excellent -yet easy to use- product that ensures your grip stays "where it should be". A simple solution to an historic problem. Comfortable to wear; easy to use. I was a little skeptical on how this product could help, but man was I wrong. What a wonderful tool you have. Keep up the good work. If you have any questions regarding the Fingerloop Golf Training Aid, please give us a call, we would be happy to help you with any questions you may have. 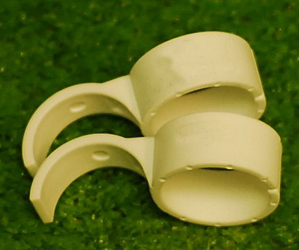 Write an online review on the Fingerloop Golf Training Aid, and share your thoughts with others.